Piazza di Spagna is home to the Spanish Steps, one of the tourist spots of Rome (pictured above). The steps were designed in 1720 to connect the piazza to the church up the hill of Trinita dei Monti and many claim the are the longest and widest set of steps in Europe. 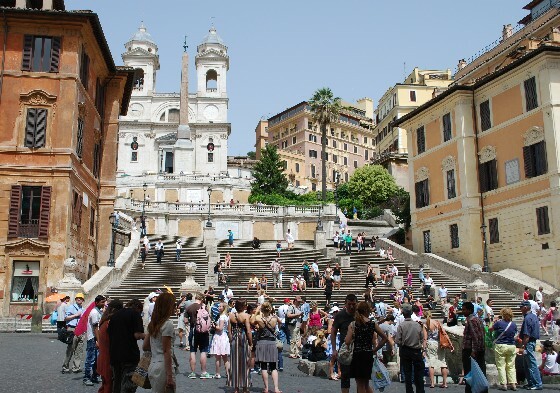 Today the steps are usually covered with tourists, but the piazza is a also meeting place for locals, a popular location for street sellers and a starting point for Rome’s horse and trap rides. This is an extract from our free Rome City Guide. 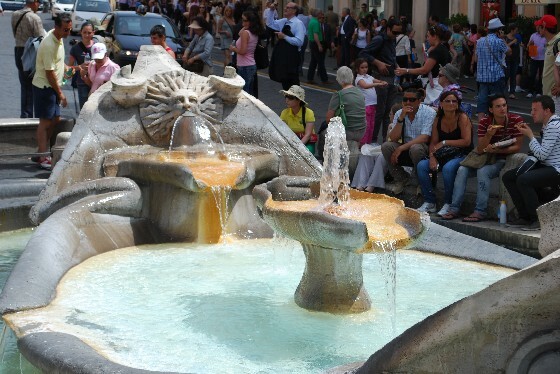 At the base of the piazza is an attractive fountain (pictured above) called Fontana della Barcaccia or Fountain of the Old Boat, which was built between 1627 and 1629. Another highlight in Piazza di Spagna is the house where English poet John Keats lived and died in 1821. It’s at the corner on the right as you begin to climb the steps and it’s now a museum dedicated to his memory. You can see the Spanish steps on the Best of Rome Walking Tour or the Rome City Bike Tour which both get great reviews from tourists who’ve taken them. Piazza di Spagna is on Via del Babuino at it’s junction with Via delle Corrozze. The piazza has it’s own Metro stop called Spagna.